Learn how to protect yourself against credit card fraud and avoid credit card skimmers. By practicing these security measures before swiping a credit card at the gas pump, you can protect yourself from identify theft and credit card fraud. Gas station credit card skimmers are external devices that thieves attach over a real credit card slot at a gas station pump. As customers swipe their cards into the skimmer, the device saves and stores card information immediately. What to look for: If a credit card slot looks different from the other card readers at the station, it might be a setup for a credit card skimming fraud. What to do: Skimming devices are meant to be placed temporarily for a matter of hours or just a day. For that reason, they are attached using only double-sided tape, so thieves can easily remove them. Before sliding a credit card through the machine, tug on the reader to ensure it is securely attached; skimmers will easily pop off with little effort. Contact the police to file a police report if you find a credit card skimmer; this is a necessary step so that the device can be placed safely in the hands of authorities. Read: What Type of Credit Card Should I Get? Watch this video to see what credit card skimmers look like at a typical gas station. Criminals usually infiltrate credit card mechanisms through the front panel of gas pumps. They implant devices internally, and these devices then capture the credit card information from within once customers swipe their cards. What to look for: Survey the gas pump’s edges — especially the hatch surrounding the credit card unit. If it looks battered, as if someone tried to pry it open, or if the lock itself is broken, it might be compromised. Some gas stations, like Shell stations, apply a tamper-proof seal across the opening of the credit card door. When a door is broken into, the sticker is lifted revealing the words “VOID” on the sticker. 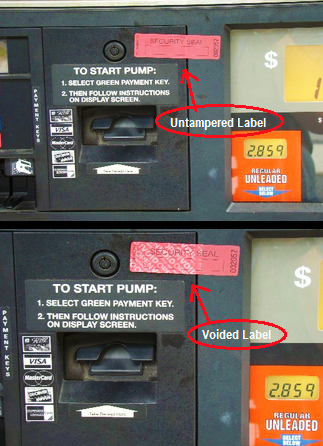 What to do: Before using a gas pump, find out whether the pump has a tamper-evident sticker. If it has one that is placed on the unit correctly — across the opening of the door — and it reads “VOID,” move on to the next pump or station. You might want to inform the gas attendant if you see a voided sticker — and you should definitely contact the local authorities to report the gas station scams in the area. If enough reports of gas station credit card fraud are forwarded, this might get an investigation started. Watch this video to see another kind of tamper-evident sticker when at the gas station. These inconspicuous cameras are so small that cardholders really have to be paying attention to spot them. They are sometimes used in conjunction with credit card skimmers to capture footage of customers entering their PIN numbers on debit cards. With this added information, criminals can commit debit card fraud and withdraw funds directly from bank accounts, as well as make fraudulent credit card purchases. For this reason, it’s always better to use a credit card at a gas station rather than a debit card. What to look for: Again, search for anything on the face of the gas pump that looks different compared to the other pumps. Pinhole cameras are often situated above the keypad area. What to do: For extra precaution, use two hands when paying for gas at the pump. Use one hand for the transaction, and place the other above the credit card screen to shield the keypad from view of lurking cameras above. Among the most dangerous tools used to steal credit card information are electronic pickpocketing devices. If you have a radio frequency ID (RFID) chip implanted in your credit card, you are susceptible to these electronic pickpocketing devices. These chips are easy to scan and allow customers the convenience of tapping — instead of swiping — their cards to make a purchase. Criminals conceal the device discreetly while walking past their victims, and use the device to scan victims’ “chipped” credit cards. What to look for: Know whether your credit cards have the RFID chip; MasterCard PayPass and Chase Blink credit cards are among those that feature the chip. No contact is needed for the device to scan credit cards — thieves only need to be a few inches away. Be wary of anyone who walks too closely to you at the pump and remain aware of your surroundings and the electronic devices that might be in others’ hands. Wrap your RFID cards in aluminum foil. It sounds funny, but it’s proven to be more effective in protecting credit card information than expensive RFID-specific wallets on the market, according to Consumer Reports. If you have a choice of pumps, choose the pump closest to the cashier. Criminals are less likely to apply credit card skimmers or other criminal tools so close to the attendant. Of course, you should still be wary of credit card skimmers, tamper-evident stickers and pinhole cameras even if you do get a pump close to the cashier. While credit cards lend convenience, if a situation just doesn’t feel right, go with your instincts and just use cash. It saves the hassle of disputing a credit card charge in the future and eliminates the chance of putting yourself at risk of long-term credit damage. If cash isn’t a possibility, cardholders also have the option of handling the transaction with the gas station attendant. Customers do still take on a small risk — as there is no guarantee that the employee isn’t using a credit card skimmer behind the counter — but can avoid the risks of pinhole cameras and gas-pump credit card readers that have been tampered with. It’s always good practice to check your bank or credit card statements to make sure the charges are correct. After filling up your car at a gas station, it’s prudent to check your accounts. If you review your statements or accounts and find that your credit card has indeed been skimmed, call your credit card or bank immediately to let them know about the fraudulent charges and to protect yourself from further criminal activity on that card. Credit cards and banks have measures set up for credit card fraud detection; consider taking advantage of these tools. For example, you might consider setting up a credit fraud alert on your accounts so you can know immediately of any fraud charges or if your account security is compromised. With cash back, no annual fee and other features, the TD Cash Visa credit card's benefits add up.